We’re honored to be Certified Medical Fitness Facility of the Year for 2018! This award presented by the MFA recognizes PWC as an exceptional facility that serves as a benchmark for the medical fitness community, composed of more than 40 certified centers nationally. 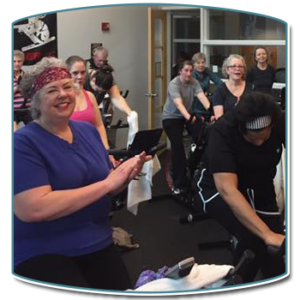 As the area’s only medically-integrated fitness and health center, Powell Wellness Center (PWC) offers FitScripts, medical programming that makes it possible for people of all ages and backgrounds to safely enhance their overall health, wellness, and physical fitness. PWC created FitScripts from the Exercise is Medicine® program, an initiative of the American College of Sports Medicine (ACSM) and the American Medical Association (AMA). It is a physician-referral program designed for those who need to exercise but who may have a chronic condition or physical limitation such as heart disease, stroke, diabetes, obesity, pulmonary disease, arthritis, or orthopedic concern that is preventing them from regular exercise. Read more on the role of exercise in supporting wellness – a local physician shares his thoughts. 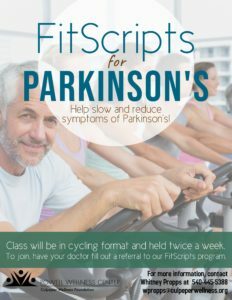 For additional information, take a look at the FitScripts brochure and referral form or contact Whitney Propps, Medical Program Leader at 540-445-5388.